1. we do not have to leave Chile and return to the former USA. 2. we can order our container and will soon have all our tools, clothes and toys! Make sure all documents match name for name, including middle name or you will be going back to the PDI office across town to get a correct document (We had to go back 3 times...... their network was down,,,,, wait,,,, I lost a document,,,,,,wait,,, wait,,,,, they did not have Thomas's full name /no middle name. It took 3 days to do this of just sitting in line!). A word of advice, when you come into Chile they give you some small papers that you must have on you all the time. One is a Tourist document that you fill out on the airplane. They will look at it, stamp it, (they love stamps)and give you the carbon to place in between the pages of your passport. STAPLE IT INTO THE PASSPORT! If you are driving an go through a police check station then they will ask you for your passport. My little paper was dropped out on the side of the interstate by the nice police man. OOPS and I did not find out till weeks later. STAPLE IT INTO YOUR PASSPORT, and you will be happier. The PDI is the Chilean FBI only the people are nicer. We befriended the two investigators ( a young lady and gentlemen) who ran our International Police Check, and they are planning on coming to our house to teach us Spanish. Plus I told the very, nice, handsome, young man (Elias) that he could date my daughter Emily when she comes down again. Hi Emily:). He was such a nice boy. Once you have a temporary residency VISA then you will not have to pay the 19% to 60% importation tax that they can hit you with, but you have only one year to get it here. Once you are a permanent resident you pay the taxes and there is no way around it. 1. Get the container list updated and emailed to the shipping agent and shipper. A local trucker in the Boiling Springs SC to ship the container to Charleston $1,000.00. He has a "Landoll Trailer" that is kind of like a rollback to load the container from off the ground. He is charging me $3.750.00 to have the 40 foot container shipped from Charleston to Coronel Chile (Conceptionone). 2. The Container must be fumigated and sealed there in South Carolina, and I must have a document saying that it has been done. 3. Once here in Chile it will be picked up at the port and delivered to the house we are staying at in the South for around $1,200.00. They have these really cool Crane Trailers that off load the container in the yard. 4. You must have a complete list of the contents. 5. NO Engine driven equipment is allowed. No lawn mowers, leaf blowers, chainsaws, weed eaters.... you get the idea. 9. No food other than canned products and then only a small amount. Well there you have it. I will let you know when it is ordered. what did you even have left to pack in that container??? After not seeing your stuff for so long, it will be like surprise presents when you start unpacking it. Lisa sorry for the late response we just saw your comment because of blogger. We bought some additional things in the USA and had our son add them to the container so that we would actually know and have what we needed and could not get here. Mostly expensive tools and cooking implements but some little things as well like school books and such. It made a real difference. Also we bought an Air compressor which would have been double here and a welder which also would have been double here. It should be Christmas in April. Slight update on timing. 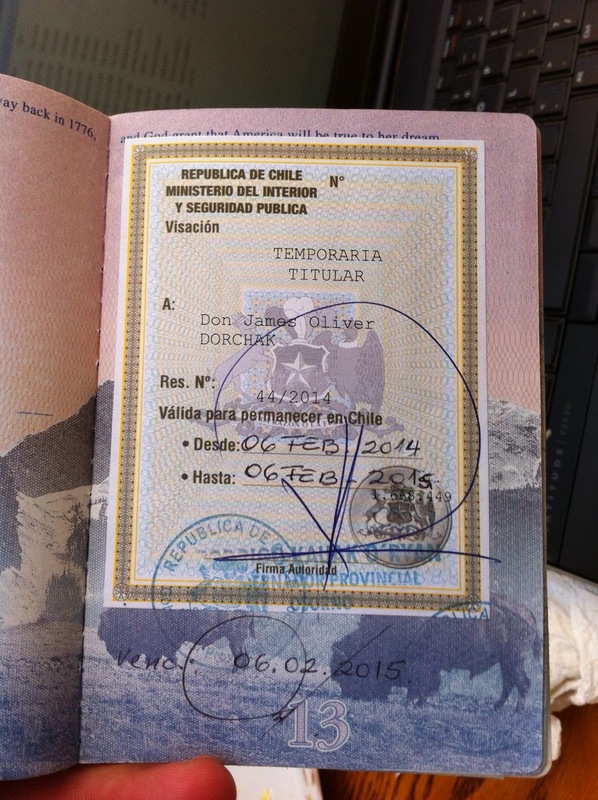 When you get your Temp visa stamp...you have 120 days (4 months) to have your "container" shipped and received in Chile. After that it is no longer VAT (tax) free. Also, the Temp visa process is taking 6 months now (it used to take 2-3.) And at month 9 of your first year under Temp visa...this is the time to start the process for a Permanent Visa application as it will take a few months to complete the paperwork and time it to coincide when you hit the 12 month mark. Thanks for this! You know it is always changing and they just can not make up their minds. We did find out the 120 day limit after we got our container here but we were still with in that time frame because we had stayed here for 90 days on our tourist visa before applying for our temp residency. I suggest you do this as well because it will let you figure out just where you want to live in Chile and other life issues like what additional things you need to be put in your container by friends and family in the USA before you send for it. Some of these items might be expensive and need saving for as well and this additional 90 days is excellent for that too. Our Temp residency goes out in Feb and we had anticipated on applying in December which would put us right on track. We really want to own some land here before then and that is our main goal right now. We have heard that it makes your application look better to own and since we need to own any way then why not eh? So we will see. Thanks for stopping by.